• address the State Duma, stating that Vladimir Putin’s “new eastern policy” and Moon’s “new northern policy” combine the achievements of the eastern and western civilizations and give the two countries endless opportunities for the development of the Eurasian region. When a lasting peace comes to the Korean Peninsula, genuine economic cooperation between the South and the North will begin, followed by trilateral cooperation with Russia’s participation. • negotiate with President Vladimir Putin and Prime Minister Dmitry Medvedev: in both cases, the participants appreciated the warming on the peninsula and expressed hope for activation of economic ties between the Russian Federation and the Republic of Korea, developing the tripartite cooperation between the two Koreas and Russia, primarily in the spheres of transportation and energy. 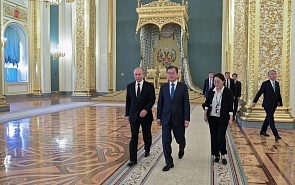 In turn, Vladimir Putin promised to continue to support the denuclearization process and the establishment of peace on the Korean peninsula. • speak at the South Korean-Russian business forum, where he announced negotiations on the preparation of a comprehensive and mutually beneficial free trade agreement. • visit Rostov-on-Don and attend the World Cup soccer match, where the national team lost to Mexico. However, Moon’s visit to Russia was not the number one news in the South Korean media. Even the “successes” of the national team at the championship in Russia got more attention. So what are the results of the visit? The South Korean president was supposed to get Russia’s support in the process of denuclearization on the Korean peninsula, and the parties were to discuss specific measures for further economic cooperation, including the connection of the Trans-Korean Railway to the Trans-Siberian Railway. On the first issue, there were no clear breakthroughs: the parties have already explicitly supported nuclear disarmament of the North and peace on the peninsula and in the region, so the leaders merely reaffirmed that the positions of Moscow and Seoul on this issue coincide. This author believes that under current conditions this is a promising project “thanks to” Moon’s populist policy in the field of energy. As of today, South Korea has decided to freeze the design and construction of new nuclear power plants and stop 8 of the 24 operating nuclear reactors, and the generation of energy at nuclear power plants fell by 36% over the past two years. Moreover, as part of the fight against micro dust (today this is a serious problem in South Korea), Seoul is going to close its old coal-fired power plants. Moon is going to compensate this by renewable energy sources, but there seems to be little understanding of how difficult and expensive it could be. As a result, he may soon face a choice – an economic crisis with political consequences, or the Russian gas. As for the “pipeline project” in general, conversations about it have been going on since 1992, if not earlier. The most recent attempt to approach this issue seriously was in September 2008 in the beginning of Lee Myung-bak’s rule, when completion of the gas pipeline was scheduled for 2017. By September 2011, an agreement was reached to start the construction, but after Kim Jong-il’s death the project was shelved, because South Korean conservatives once again anticipated the imminent crash of the regime. Negotiations on a free trade agreement between South Korea and Russia also began in 2007, but were suspended on the Russian initiative. Some Russian experts and politicians were pleased with Moon’s Eurasian rhetoric, but this author is not sure that South Koreans understand this term the same way as the Russians do. De facto, we face the re-engagement of Park Geun-hye’s “Eurasian Initiative,” proclaimed by her back in 2013 and aimed at diversifying political and economic ties and making friends with continental powers, setting up additional pressure on the DPRK: you see how we could trade well, but for North Korea, so let’s do something with Pyongyang for the general Eurasian convenience. However, instead of mentioning his predecessor, Moon extended a bridge to the “northern policy” of Roh Tae-woo. In general, when analyzing the relations between the Russian Federation and the Republic of Korea, we must remember one important thing. On the one hand, if we compare Russia’s and South Korea’s relations with the relations of Seoul with other neighboring countries, they are the most problem-free. They do not have those obstacles that, for example, complicate relations between Seoul and Tokyo, or between Seoul and Washington. However, the reverse side of the problem is a certain lack of common ground, both political and economic. Otherwise, all the grandiose projects, voiced once again by Moon Jae-in, would have been realized long ago. Moon is looking for directions with a rather easy realization of certain political advantages. After all, even inter-Korean cooperation has its limits – with several steps in the direction of consensus, Kim Jong-un made it clear that he will continue to move only after the reciprocal steps. Therefore, Moon switches to cooperation with Russia, and the results here can have a good look for the internal audience.